Since Ralph Nader's controversial book "Unsafe at Any Speed" was published over 40 years ago, seat belts, padded dashboards, collapsible steering columns, improved bumpers and other safety features have become standard fitment. After seat belts, the most significant advance in automotive safety has been the airbag. Gas-inflated airbags that rapidly discharge from compartments concealed in steering columns, dashboards, roof rails, doors and seats have saved millions of lives since their early standard fitment by Mercedes Benz in 1986. The National Highway Traffic Safety Administration estimates that airbags have saved more than 2,300 lives a year (In North America) since compulsory fitment in 1996. NHTSA calculates that using a seat belt and having an airbag reduces the risk of death by 61 percent. Simply put, this combination is the most basic and effective safety precaution available. Or so it should be: But what happens when the very device we rely on to save lives is responsible for fatalities? 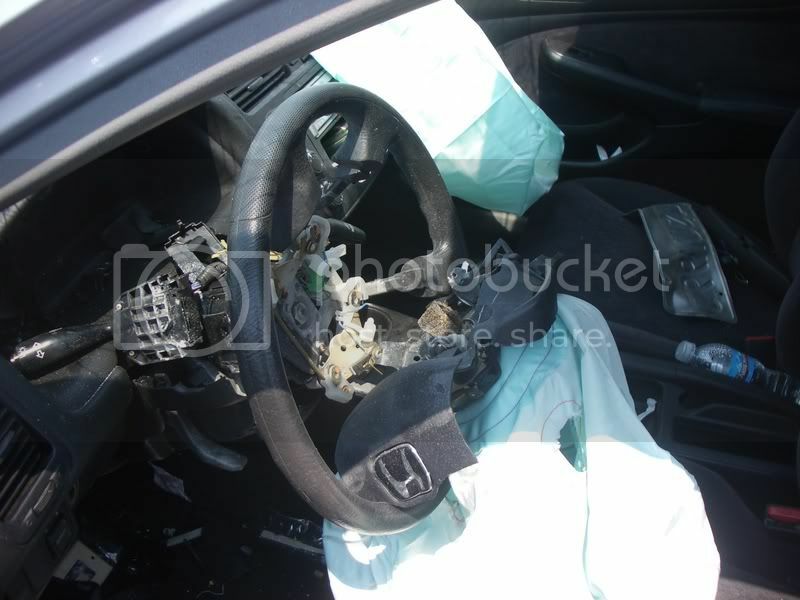 The first reported airbag shrapnel deployment took place in a Honda in 2004, with Honda settling several injury claims but not issuing a recall until 2008; and then only for about 4,000 Civics and Accords. 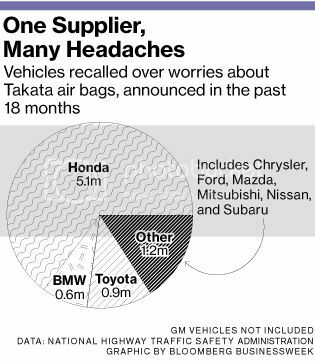 It appears Honda only informed Takata of the airbag problems in 2007, and since then Honda has steadily expanded recalls, including a recall of nearly 440,000 cars in 2010; but without acknowledging previous deaths or injuries. After several years and umpteen recalls, Takata air bags are finally the target of a U.S. safety investigation that started earlier this year over the risk that they could explode during an accident, spraying occupants with metal shards. More than 16 million vehicles made by nearly a dozen different automakers have been recalled globally since 2008. A New York Times report in September found at least 139 reported injuries across all automakers. According to the Times Honda, the highest user of Takata airbags, have experienced at least two deaths and 30 injuries since the problem with faulty inflators was first reported in 2004. Honda and Takata allegedly chose not to notify NHTSA in previous recall filings that the affected airbags had actually ruptured or were linked to injuries and deaths. Initially Takata claimed that propellant chemicals were mishandled and improperly stored during assembly, which supposedly caused the metal airbag inflators to burst open due to excessive pressure. In July, the company blamed humid weather and anounced additional recalls. However according to documents reviewed by Reuters, Takata also claims that rust, bad welds, and even chewing gum dropped into at least one inflator have also caused failures. The same documents show that in 2002, Takata’s plant in Mexico allowed a defect rate that was "six to eight times above" acceptable limits, or roughly 60 to 80 defective parts for every 1 million airbag inflators shipped. Disturbingly the report suggests that Takata already knew about the airbag issues in 2004, conducting secret tests out of work hours to verify the problem. The results confirmed major issues with the inflators, and engineers quickly began working on a solution. But instead of notifying federal safety regulators and moving forward with fixes, Takata executives ordered the engineers to destroy the data and dispose of the physical evidence. This occurred a full four years before Takata publicly acknowledged the problem. What Takata has however conceded is that, similar to GM with the ignition switch recall, record keeping and traceability procedures were violated. In at least one case, inadequate quality-control records, resulted in hundreds of thousands of cars being recalled to find a small number of faulty airbags, a decade after they were made. In an effort to overcome the obvious organisational problems, in July Takata Corp. rehired the retired vice president of engineering, Al Bernat, to oversee its embattled quality-control operation. Bernat's return came shortly after the National Highway Traffic Safety Administration announced on June 11 that it would reopen its investigation into malfunctioning airbags in vehicles produced by Honda, Nissan, Mazda, Chrysler and Toyota. At the root of the most recent problem appears to be the pyrotechnic propellant that Takata uses to inflate the airbag. Unlike other manufacturers, such as Autoliv and TRW Automotive who use less volatile guanidine nitrate as the main ingredient, Takata uses ammonium nitrate, an inexpensive chemical commonly found in fertilizer and explosives. Based on the known storage issues and testing that indicated humidity could adversely affect the performance of the inflator, initial action was restricted to so-called "limited regional recalls." So instead of issuing blanket recalls for all vehicles, they’re limited to more tropical climates, like Florida. The U.S. regional recall has involved 4.1 million cars in hot and humid areas where the air bags may be prone to fail, including Florida, Alabama, Mississippi, Georgia, Louisiana and parts of Texas along the Gulf of Mexico. Most of those cars are made by Honda Motor, Takata's biggest client. "The only thing a geographic recall does is it saves money; it doesn’t save lives," Clarence Ditlow, executive director of the Center for Auto Safety, an independent consumer rights group founded in 1970, reported to International Business Times. Ditlow points out that some automakers are taking their own no-risk action and have recalled all affected vehicles. "Just take a look at what BMW is doing. They’re saying, ‘we’re not buying into these geographic recalls.’" Instead, BMW is taking all affected models back to fix the problem. On November 18 NHTSA called on Takata Corp and five automakers to expand the regional recall to a full nationwide exercise, increasing pressure on the industry to move faster in a growing scandal. At the same time scolding Takata for what it called "an unwillingness to move forward" on the nationwide recall, and said the company needs to be open with the U.S. public about the risks of its air bags. 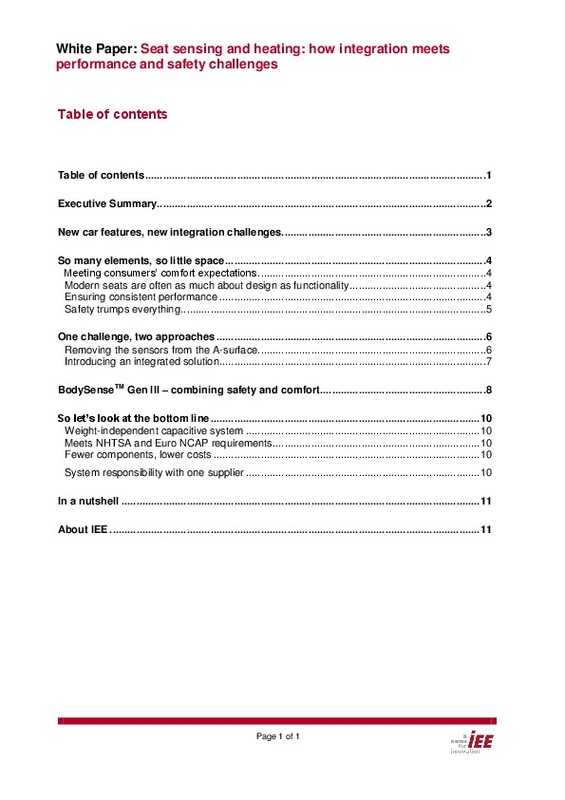 However, this may be easier said than done: Parts availability would appear to be a problem as cited in a communication from Honda to it’s dealers on 22 September 2013 telling them not to "proactively contact customers at this time" because there were not enough replacement parts. With an estimated 17 million cars worldwide fitted with problematic Takata-made air bags, such as those linked to the four deaths in the U.S. and one in Malaysia, the manufacturer is under severe pressure to come up with a solution that is implementable while curtailing any further loss of life. Once again a recall has raised questions around how the automotive industry conducts business. Even as a federal grand jury investigates Takata Corp.’s defective airbags as part of a criminal probe, the general public remains largely in the dark about the components that have led to the recall of more than 11 million U.S. vehicles. The reason, experts say: Automakers and plaintiffs are settling injury complaints out of court. The deals, common in product liability complaints, also help explain why regulators and drivers still don’t know the exact cause of the defect or the extent of the injury risk. "It’s very murky," Ralph Nader, the longtime American auto safety consumer advocate, told Bloomberg. 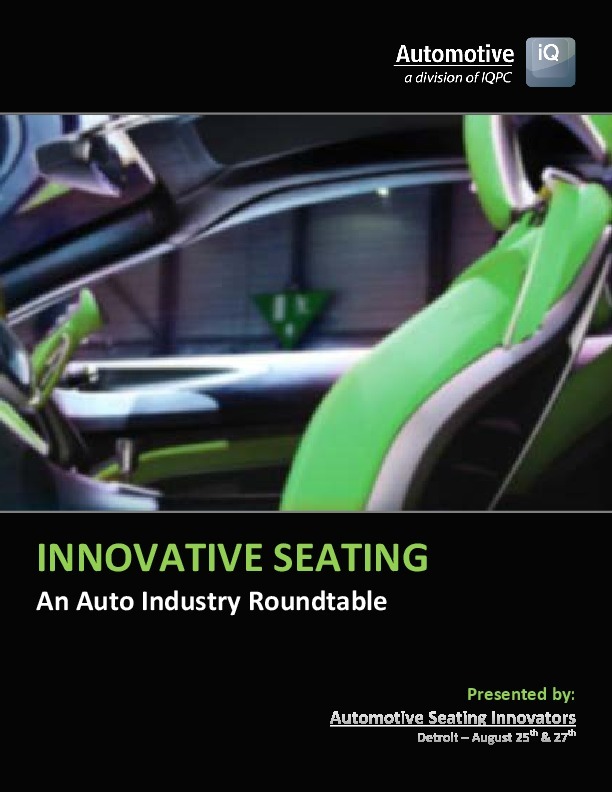 "There’s a lot there that escapes NHTSA , escapes Congress, escapes the media, escapes the consumer groups. The best information is usually coming out of product-liability suits, but they’re settling out. There haven’t been any public trials yet." Even though Takata is expected to lose a staggering $235 million (24 billion yen) this year after it had previously forecast a gain of $156 million one wonders what the company’s priorities are: Company profits and short term reputation containment; or consumer safety?